For over 40 years, Fox has been the leader in gear and accessories for action sports of all types, starting with Motocross and expanding to mountain biking, BMX, and even surfing. In the spirit of keeping you outfitted from head to toe, the Rampage Helmet is a perfect addition to any kit. The super light fiberglass shell prevents the helmet from weighing too heavy on your head during a long day spent riding. This shell is also incredibly durable, and when combined with the inner EPS foam core, the result is an incredibly hardy helmet that can take a beating if it needs to. 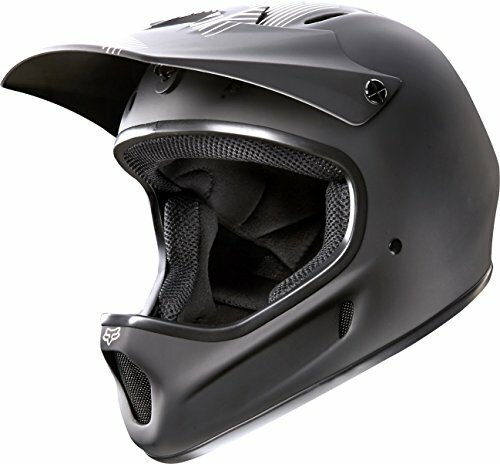 Soft cheek pads, inner lining, and double D-ring strap keep the helmet in place, which means less irritation for you. 11 vents allow for plenty of airflow, lessening the risk of overheating, as well as keeping you comfortable. Additionally, if you’re in to wearing goggles, the Rampage features an eye-opening large enough to be compatible with most modern types. An ideal blend of quality, durability, and slick Moto styling, the Rampage will be the helmet you come back to, again and again. Available in sizes Small to X-Large.SAFETY – The combination of the fiberglass shell and EPS interior make the Rampage Helmet incredibly durable, able to take the full brunt of an impact without transferring it to you. The larger eye-opening also allows you to wear goggles, to better protect against debris and dirt. COMFORT – 11 well placed vents allow for greater airflow to keep you cool and dry, all ride long. Soft cheek pads, a comfort inner lining and double D-ring strap keep the helmet secure, so you won’t need to constantly stop and readjust, letting you focus on the ride, and not on the helmet. STYLE – Look cool, everywhere you go. Classic moto helmet styling is accentuated by eye-catching Fox branding, giving you all the street cred you deserve. No matter where you wear this helmet, you’re sure to stand out from the rest. USE – Developed with MX riders in mind, the Rampage is competition ready. Perfect for enduro, freestyle, or traditional motocross, this helmet can stand up to whatever you throw at it. Life is short, go wild!